Today was one of the most beautiful drives! I give the Klondike Highway a five star rating in roads I have driven. The road had spectacular scenery that was constantly changing. It had windy turns and curve after curve with lots of pull outs to take pictures. There were beautiful lakes that were the gorgeous teal- green color on account of marl, there was snow, and there was the world’s smallest desert. The day started with Jaz cooking my breakfast. We stayed in a “B and Cook your own Breakfast” last night in Dawson. 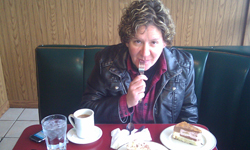 It was a decent place within walking distance of downtown Whitehorse. We opted for Sanchez’ Cantina for Mexican food and a margarita. The food was the best two borders north of the border! Amazing that Whitehorse would have such a gem. We learned later that the woman that runs the place spends winters in Mexico with her family. We hit the grocery store on the way out of town and our observations on Canadians still hold true. They only have two speeds: slow and very slow. The Canadian guy next two us overheard us talking about this and added this was the case unless you were from Vancouver or Toronto, and then you were a little faster. He said folks from smaller parts of Canada go to the city for a vacation to speed up temporarily. He was frustrated too. We headed out of town with a Canadian Mountie on our tail so we were very careful not to speed! The last thing I wanted was a ticket in Canada. He soon lost interest. 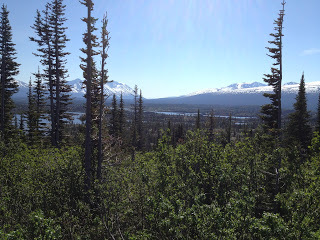 Not too far down the road we tuned south and left the Yukon Territory. There were no “Oh Crap” or “Oh My God” moments on this road, likely because it was a nice chip-seal all the way. There were less bugs, but also less flowers. Yesterday, the road from Dawson to Whitehorse was lined on both sides for a couple of hundred miles with wildflowers; purple lines of dwarf fireweed. I failed to get pictures of that. Next time. 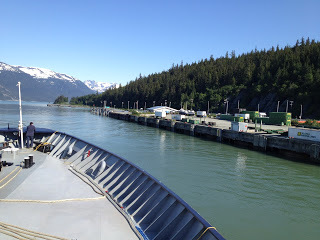 We passed into amerika and into the town of Skagway, Alaska. 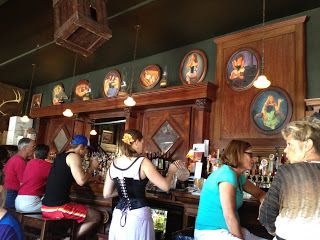 We rolled right up to the Red Onion Saloon, parked, and walked in and ordered pizza. For those of you that do not know the Red Onion, it is a must see while visiting Skagway. It is a historic brothel turned pizza place. You can still tour the cribs upstairs for $5, which, apparently, is what a client paid in 1898 for 15 minutes. I picked up a couple of garter belts for souvenirs and we headed out the door to walk the town. The Soapy Smith parlor was sporting a new roof, but the building has a long way to go before it’s finished. 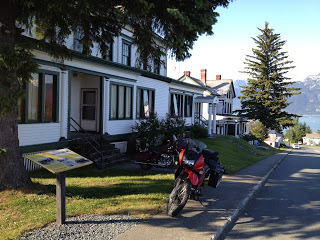 We caught the early evening ferry for Haines and were checked into the historic Halsingland Hotel at Fort Seward for the evening. We spent the evening dining on lamb and sipping cosmos. 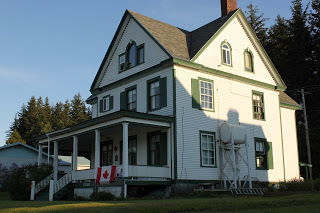 Afterwords, we walked the National Historic Landmark, Fort Seward and took photographs. I took one in particular that made me chuckle. Here is the photo… can you guess why I chuckled? The Halsingland has historic plumbing too. I took a messy shower and got the floor wet, then Jaz walked in and we almost had a “woman down!” moment. It would be a shame to travel this far and have her slip in the bathroom and hurt herself. Most accidents occur in the bathroom. I think I will increase my motorcycle mileage and decrease my baths. 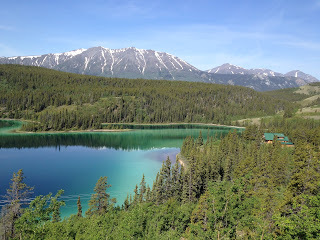 We will next be off to someplace near Kluane National Park and Preserve. We reserved a place out there, and the proprietor said it was “rustic” and if we wanted to eat food we should pack it in. Hmmm. Rustic as defined by a Canadian could be interesting! I’ll let you know in Tok – the day after tomorrow. Chances are that if he doesn’t have food he doesn’t have wifi. Is that water safe to drink? Awesome post. Thanks. Awaiting tales of the rustic. Rustic, hmm, very intriguing, yes .. hopefully camera batteries charged to document for us house-bound Americans. Losing the shampoo is probably less tragic than losing the beer!